NEW YORK - Mayor Bill de Blasio is set to meet with leaders of the city's five police unions Tuesday, a day after he faced some boos and catcalls while addressing recruits at a police graduation ceremony. De Blasio's office announced plans Monday for the meeting with the unions, including the Patrolmen's Benevolent Association and the Sergeants' Benevolent Association, CBS New York reports. Police Commissioner Bill Bratton is also slated to attend. 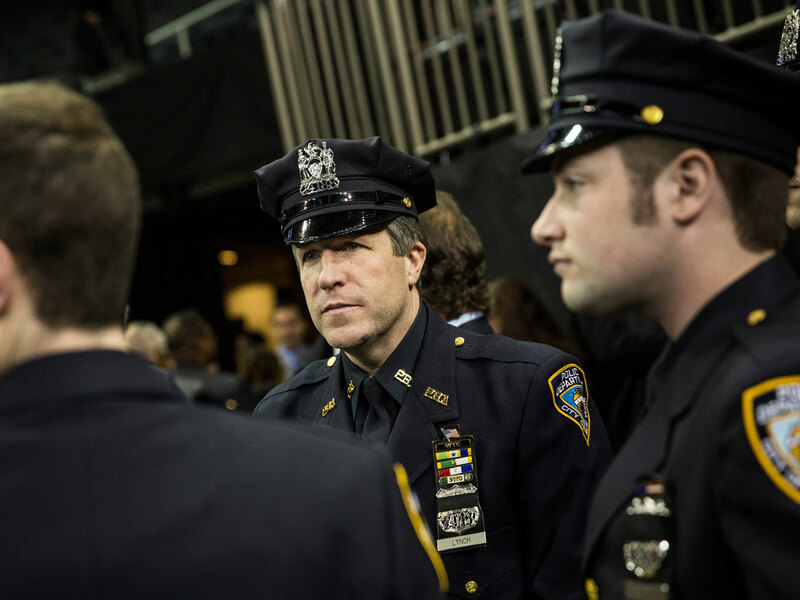 A rift between de Blasio and much of the NYPD's rank and file has widened recently. The Democratic mayor was elected last year on promises of keeping crime low while reforming the NYPD. Meanwhile, police unions have been seeking new contracts. Union leaders have said the mayor fostered an anti-NYPD atmosphere that contributed to the deaths of officers Rafael Ramos and Wenjian Liu after a grand jury decided not to indict an officer in the death of Eric Garner. Following the Garner decision, de Blasio said he and his wife, Chirlane, have had painful conversations with their teenage son, Dante, about "how to take special care with any encounter he may have with police officers." Ramos and Liu were ambushed and killed as they sat in their patrol car Dec. 20. Prior to the shooting, the gunman, Ismaaiyl Brinsley, wrote in an Instagram post that he would put "wings on pigs" and made references to Garner and death of Michael Brown in Ferguson, Missouri. At the NYPD graduation ceremony Monday, some in the crowd could be heard booing and heckling the mayor when he was introduced. About a dozen or so people in the stands stood with their backs turned to de Blasio. On Saturday, hundreds of officers turned their backs to a video monitor as they watched de Blasio eulogize Ramos at his funeral in Queens. The silent protest was a continuation of the defiance shown at the hospital after the officers' slayings when PBA President Patrick Lynch and others turned their backs on de Blasio. "There's blood on many hands tonight," Lynch said the night of the shooting. "That blood on the hands starts on the steps of City Hall in the office of the mayor." Detectives' Endowment Association President Michael Palladino, who will be at Tuesday's meeting, said he believes productive dialogue is a step in the right direction. "So things can get better and hopefully, they won't get worse before they get better," he told CBS New York. He said he also wants to see steps taken to prevent violence against officers. "If we're going to have some type of healing process, the first thing that has to happen is the threats and the violence against the police has to stop," he said. "And with respect to future protests that are going to go on, we need to have some ground rules. We can't have lawlessness." NYPD commissioner: Officers' morale is "low"
In a tweet Monday night that appears to have since been deleted, CBS New York reports the NYC Sergeants Benevolent Association said the mayor "needs to humble himself and change his philosophical views on policing and the way protests have occurred within the city." Bratton acknowledged that the morale of officers is low and said their actions "unfortunately" reflected the feelings of some toward the mayor. But he insisted de Blasio has been supportive of police, noting that the city has given the NYPD hundreds of millions of dollars that was not budgeted, much of it devoted to improving officer safety. He also admonished officers who turned their backs on de Blasio during Ramos' funeral, calling it "very inappropriate" to make political statements at a funeral like that. De Blasio was elected last year on promises of keeping crime low while reforming the NYPD. Meanwhile, police unions have been seeking new contracts.